A young man named Alan goes to Mexico to ask his fiancee's father if he could marry her. Join Alan in his unforgettable journey int new exciting Hidden Object game under the title Calavera: The Day of the Dead! The main character has no idea what kind of dangerous adventures wait for him in this mysterious place! World of the dead, rescuing his beloved, the struggle between good and evil. Will Alan overcome all obstacles? Wait for the release of the game Calavera: The Day of the Dead and get to know the answer to this question! Coming soon! Title - Calavera: The Day of the Dead Game Download for PC and Mac Description - Look at Calavera: The Day of the Dead, a Hidden Object game elaborated by TabaGames. Go to a Mexican town and save your beloved from the danger! Maybe the best thing about this game called Calavera: Day of the Dead is that it has an extraordinary story, which will spark interest in you almost instantly. It starts off as a love story between Alan and Catalina, who plan to get married. However, they need to get the blessing from Catalina’s father who lives in a small town in Mexico. They take the trip to this small town just in time to arrive for the festivity in Mexico, when the dead are revered. This holiday includes wearing skeleton masks and other scary apparel. This is why Alan and Catalina aren’t too alarmed when they arrive, but they start to get worried when her father does not arrive at the train station! What is even worse, Catalina is soon enough kidnapped and you are left alone to investigate these mysterious occurrences and find a way to save the one you love! Even if the storyline is not the most important thing for you when you play games, the gameplay must be important. 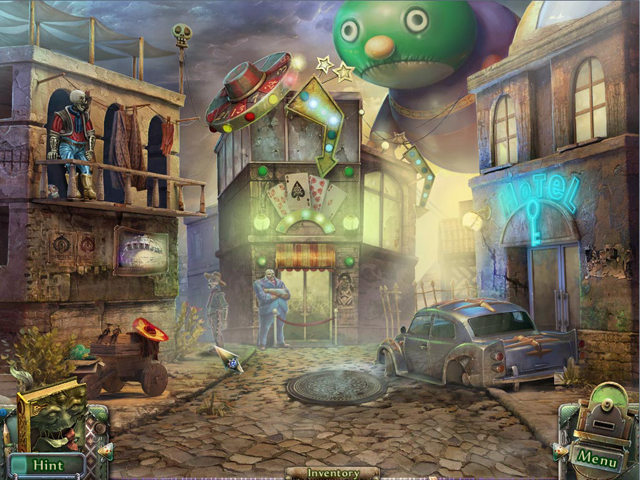 If you decide to try the free trial version of this hidden object game, you will have a lot of fun, but Calavera: Day of the Dead shows its richness exactly in adventure and puzzle elements which you will have enough time to savor if you purchase the full version of the game. 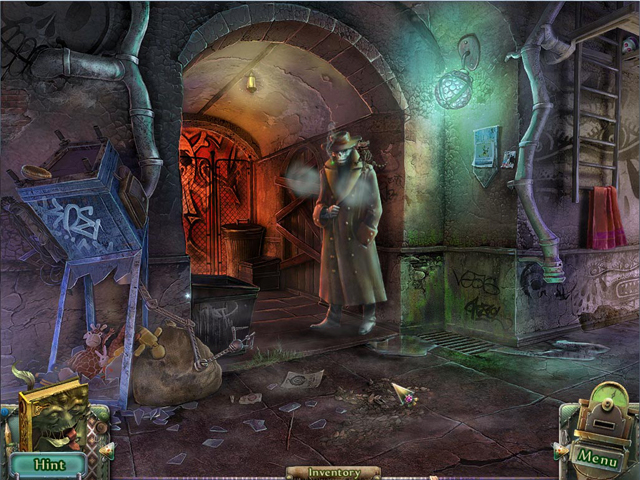 This newly forged mixture of different genres relies on the more traditional hidden object scenes, with textual interactive lists of objects that need to be found. Combining several elements to complete an object is not exactly the newest invention, but the puzzles here are really innovative. What is even more important, they are not too easy, so you will have to observe and act timely if you want to solve these. You will have the opportunity to choose between several difficulty levels, and of course, if you get stuck, you can use various methods to solve the problem. You can consult your map, or you could use hints or skip buttons. One little problem with hints is that they refill quite slowly, but that only makes the game a bit more challenging. Of course, there are plenty of achievements and collectable skulls spread over seven chapters in game. Finally, Calavera: Day of the Dead wouldn’t be so good if it hadn’t been for its majestic visual and audio experience. This game really has to offer many themes from Mexican culture – from the backgrounds and environments, character models and voice acting to the ornaments in shape of sugar skulls and other figurines. Fairly simple graphics may be a downside to this tremendous visual experience. Music is great and original, and you can adjust the volume in the options. All in all, Calavera: Day of the Dead is a mixture of hidden object game with elements of adventure and puzzles. Its storyline is amazing, especially because it is supported by dazzling audio-visual experience and innovative gameplay. Do not miss this game!